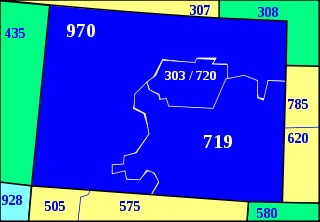 Clickable map of Colorado area codes in blue (with border states). Area codes 303 and 720 are telephone area codes serving the north-central portion of the state of Colorado. They cover Denver, Lakewood, Littleton, Boulder, Longmont, Aurora, Castle Rock and most of the Front Range. Area code 303 is the original area code, while area code 720 is an overlay, meaning that the same physical service area is served by both area codes (303 and 720) and that ten-digit dialing is required for all calls made within the service area. Area code 303 was one of the original area codes put into service in 1947, and originally covered the entire state of Colorado. Despite Colorado's dramatic growth during the second half of the 20th century (especially in the Denver area), it remained the sole area code in Colorado for over 40 years. By the late 1980s, an impending number shortage made a split necessary. On March 5, 1988, southeastern Colorado, including Colorado Springs and Pueblo, became area code 719. The northeastern and western portions of area code 303, including Fort Collins, Grand Junction, Vail and Aspen, switched to area code 970 on April 2, 1995, reducing 303 to cover Denver and the Front Range. With the 1995 split, 303 is the only Colorado area code that does not border another state. The 1995 split was intended as a long-term solution. However, within two years 303 was close to exhaustion once again. The Front Range is home not only to most of Colorado's landlines, but also most of the state's cell phones, fax machines and pagers. To solve this problem, 720 was activated as an overlay on June 1, 1998. The 303/720 area is one of the largest toll-free calling zones in the western United States. With the exception of Roggen, Brighton, and Wiggins, no long-distance charges are applied to any calls made from one phone to another in the area. With the exception of Roggen, all users in the 303/720 area code must dial all ten digits to reach a destination phone, even if that phone is next door. ^ "Area Codes Map, Colorado". NANPA. Retrieved 2018-04-24. ^ "Local Calling Guide". Retrieved September 30, 2012.